One of our most popular destinations is Disneyland in Anaheim, California. If you need a Disneyland Shuttle from the Disneyland Hotel or from the Airport, then John Wayne Shuttle Airport Association is the van service for you. We offer quick, safe, and affordable Disneyland shuttle services to and from John Wayne Airport. Our Disneyland shuttle van service is the best choice to get to Disneyland from John Wayne Airport. Our large vans can accommodate large parties of six or more people. We run numerous Disneyland shuttles from John Wayne Airport (SNA) daily. We offer special rates for our Disneyland shuttle. We will take you to Disneyland Hotel or other nearby hotels without hassle or delay. Disneyland Resort is located in Anaheim, California. Anaheim is in Orange County, part of the greater Los Angeles metropolitan area. The official Disneyland Address is 1313 S. Harbor Boulevard, Anaheim, CA. Disneyland: The original theme park that stands head and shoulders above its competitors. Allow one to two full days to explore the park. Add another half day if you want to take a special park tour. California Adventure: A newer park that puts California's best on display, distilled into rides, shows and attractions. Allow one day for this park. If you buy a multi-day / multi-park pass you to visit both parks in the same day. Some people do everything at California Adventure and still have a few hours left over. Downtown Disney: Shopping, restaurants and entertainment. Downtown Disney is free to the public. Whether you're on a business or a vacation, choose John Wayne Airport Shuttle service LAX to Disneyland. 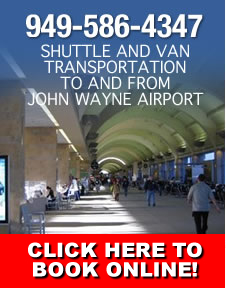 Established in 1998, John Wayne Airport Shuttle has achieved a high level of shuttle service LAX to and from Disneyland. We provide on-time shuttle service lax to Disneyland, driven by courteous and professional drivers, plus the safest and most expeditious ride to your destination. It is our goal to answer all of our client's needs especially with Disneyland shuttle services from LAX or Disneyland shuttle services to John Wayne Airport (SNA). John Wayne Airport Shuttle Association reprensents the shuttle and van drivers operating out of John Wayne Airport in Santa Ana, California. The association serves all of Orange County California specializing in Disneyland Shuttle services to and from the Anaheim Convention Center, John Wayne Airport and LAX. © Copyright 2015-2009. JWA CC Shuttle Association. All rights reserved.